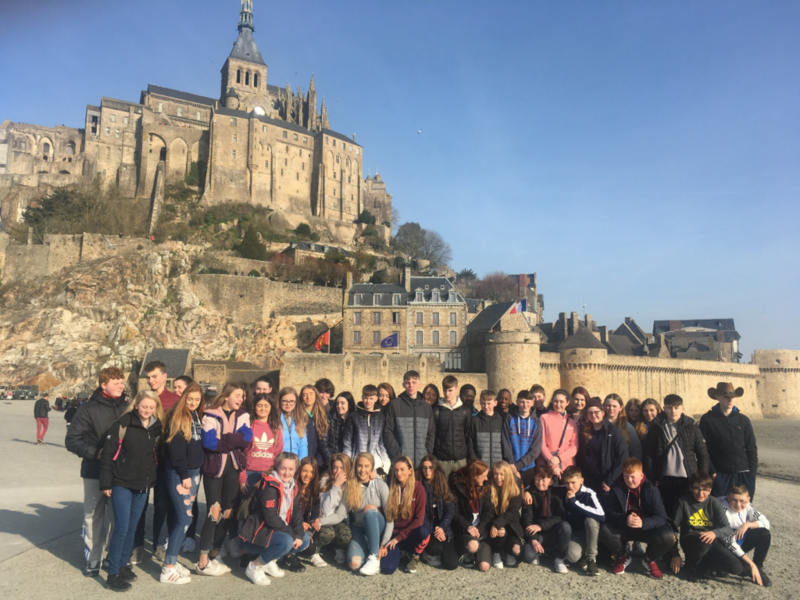 A group of second year students have recently returned from a four-day trip to France where they had a first-hand experience at trying out their language skills and experiencing some of the famous tourist attractions and landmarks that the country has to offer. Our roving reporter, second year Megan Murrin, compiled this daily diary of the students’ experiences. Thursday February 14th: On our first day in France, we went to Disneyland, which is one of main places to visit in Paris. Some of us were brave enough to go on the bigger rides such as “Hyperspace Mountain” and “The Tower of Terror”, whereas others stuck to the smaller attractions, such as “It’s a Small World”. That evening, we went to Planet Hollywood for dinner and stayed overnight at the Adventure’s Disney Hotel. Friday February 15th : By about nine o’clock the following day, we were on our way to central Paris, where we took doing a walking tour around the city to see its amazing attractions. We went to see the extraordinary Eiffel Tower, Notre Dame and the Arc de Triomphe, as well as the Passerelle des Arts, a bridge with locks that can represent a seal of love or friendship. My good friend and I couldn’t pass the opportunity to put a lock of our own on the bridge, which was a truly memorable thing to do. Although at the end of the tour our feet were extremely tired, it was worth every step. After a lengthy bus journey, we eventually made it to the second hotel, where we got food at the ‘Poire Rouge’ and stayed our second night. Saturday February 16th : The next day, we drove to the famous Mont-Saint-Michel, a small island close to Normandy. We spent the day browsing around the little shops scattered throughout the island and climbing the many stairs to get to the beautiful view that can be seen from higher ground. Afterwards, we visited The Biscuit Factory, a famous biscuit shop close to Mont-Saint-Michel. We then returned back to the hotel, had dinner one last time in the ‘Poire Rouge’, and enjoyed our final night in France. Sunday February 17th : On our last day, we went to Colleville-sur-Mer, which has thousands of crosses to honour the memory of the many thousands of soldiers who lost their lives in the Battle of Normandy. It was harrowing to see the amount of men, women and children who died throughout the dreadful battle. Soon after, we went to see a film about the Battle of Normandy in a 3D cinema. In the cinema, we were surrounded by multiple screens which showed different unseen footage of the battle. Again, it was very sad to see just how much death and destruction was caused by the battle and it was truly a more effective way of learning rather than reading it off a page. We then all returned back to the bus and began the journey home. I have made many brilliant memories on this trip and have had an experience that I will never forget.